When I was in high school, I told my grandmother that I wanted to be an archaeologist. While everyone around me was telling me that medicine was the right path for me (I’m Indian, it’s the default assumed profession), I was convinced that I would be happy and content digging in the dirt. My grandmother then laughed and asked me why I was so interested in looking for dinosaur bones. When I told her that was paleontology and not archaeology, clearly two different disciplines, she laughed again. Harder. Needless to say, I am currently not an archaeologist. For as long as I can remember, the earth and stuff from history buried in the earth have always intrigued me. Geology, paleontology, and archaeology were the stuff that fascinated me as a kid. And Power Rangers, but that’s a different story. I wanted to be a mix of Ross from Friends, who by the way, was a paleontologist, and Indiana Jones. Well, maybe not, but I was very interested in what the ground had to offer for me discover, particularly when it came to ancient cultures and civilizations. No ancient civilization wooed me as compellingly as ancient Egypt. Egypt, with her dual kingdoms and audacious building projects, themselves little more than monumental grave markers. Historians claim that the Great Sphinx, the Great Pyramid and the other pyramids in the Giza Necropolis were already built and standing for over a millenium before the exodus of the Israelites from the biblical account even happened. Egypt with her pyramids and pharaohs and pantheon of deities. Egypt with her mummies. Archaeologists have found many of these mummified corpses, housed in elaborate coffins that were then placed in stone sarcophagi. The body of the deceased would be embalmed and wrapped in linens, with its vital organs removed and preserved, and then placed into a carved wooden coffin, which in turn would be placed into the rectangular sarcophagus. The idea was that the spirit of the deceased would return into its body, and so to help the returning spirit distinguish its body, the faces of the pharaohs were carved and painted onto the lids of the sarcophagi. What strikes me is how bright and vivid these ornate coffins are. Many of them are very stylized and intricate, gilded and painted with deep, rich colors and have been attempted to look lively and life-like. Some of the coffins of the royalty were overlaid with, or even made with gold and silver. And despite how beautiful the outside of the coffin is, just one peek under the lid reveals the grave truth (no pun intended… okay, maybe): what lies within is dead, decaying and decomposing. You will never pop the hood and find life. That description is pretty accurate when it comes to humanity. We spend so much effort and money and time trying to ensure that we look a certain way, maintain a certain image and have everything in order. We paint ourselves with education, money, and fame, trying convince everyone that what’s on the outside is who we really are. We live to satisfy this image that we bear. And all the while, inside we’re dead. We’re life-less corpses walking around in magnificent human bodies. This is exactly how the apostle Paul describes us in the New Testament: dead apart from Christ. Not that we’re physically dead (although sin will certainly lead to that) but that spiritually, what lies within our earth-suit lacks a pulse. There seems to be no purpose or goodness to life, and we live knowing that there is more, just unsure of what it is. The risen Christ is a testament to Jesus’ power over death. God makes us alive with Christ in His resurrection, reaching into our dead hearts and replacing them with living, beating, thriving hearts. Our spirits can rejoice because in Christ, life has purpose and reason and meaning. We are no longer selfish beings looking to extend our legacies far beyond our lives, which is what the Egyptians had attempted to do with their mummies and building projects. No, we live in Christ as proclaimers of the love of God in this life and heirs of His promise in the hereafter. In Christ, we are no longer zombies or walking coffins. In Jesus, we do not live in mindless wandering, attempting to appear as if we’re alive. We are alive and our identity is found in Jesus. The image we project is not an idealized self-portrait, but we display and proclaim Christ in our lives. We live to make His name great. Christian, live in this identity. Two thousand years ago, a body lay in a tomb, wrapped in ceremonial burial linens. This body didn’t stay in the linens, though. Jesus the Christ rose from grave and gives us a promise that if we are in Him, death will not be our final resting place either. As long as I can remember, I’ve loved things pertaining to history and geology. Okay, go ahead. Cue the jokes, comments, snide remarks. Seriously though. Rocks. Dinosaur fossils. Ancient civilizations. In First Grade, I had a really impressive rock collection. But a lot of young boys did back then. Rocks were what Pokemon cards were for my brother’s generation. Okay, maybe I chose the wrong metaphor. But rocks were way cool. Maybe I’m just making a case for why I was/am a geek. I took the bus home from school, and the bus stop was about a block away from where we lived. My dad tells me that he would stand by the window and watch me as I made the 3 minute walk back to our apartment. Well… It took 3 minutes for everyone else. I dragged it out to 30 minutes. He said I would just idly walk, peering at the sky and the things around me, stopping every other step to kneel down and grab a rock/stone off the ground. I’d curiously examine it, turning it over, mulling over it. If I liked it, I would proceed to put it in my backpack. If I didn’t, I would put it back down, and move on to the next one. Apparently I did this with leaves too… But that’s just silly, right? My backpack was heavy with rocks, which settled at the bottom of the bag. When I got home, I would put them out on my shelf, on display for all the world to see. Usually, “all the world” was just me. But I was amazed at rocks! At the process they went through. At their age. Their seeming commonality, and yet uniqueness. How God brought all these things to be. Whatever happened to collecting things??? I know other kids had their baseball and basketball cards. My cousin Debbie had stickers. I even had old and foreign coins. We weren’t just glued to the latest video game. 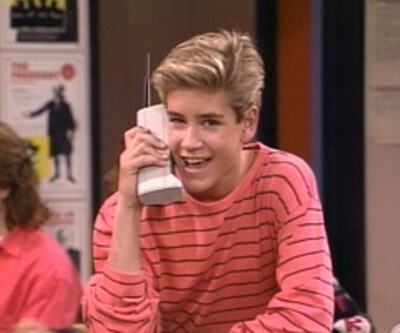 Cell phones were just things Zack Morris had. Maybe we are in a totally different era. My sister laughs when I tell her about my love of rocks. Maybe legitimately so. But maybe staring at a screen is all we have time for. Staring at a screen like the one I’m staring at as I type this. But surely there are things in our lives that are not just technology-driven. Maybe I’m just a nerd. Do you remember those days? Break off the chains of circuitry every now and then. Pick up a hobby. What did you/do you collect?